Doctor Jose Manuel Soldevilla completed his degree in the Center of University Studies CEU and School of Medicine at University of Madrid, obtaining the specialty of Rehabilitation and Physical Medicine at the Hospital Ramon y Cajal of Madrid. Also, Jose Manuel is a specialist in work medicine and has his diploma in health medicine. – Responsable of Rehabilitation Department in Hospital “Los Nardos”, Madrid. – Responsable of Rehabilitation Department in CRF (Center of Rehabilitation and Physiotherapy), during 7 years. – Responsable of Rehabilitation Unit of Clinical Center “La Chopera”, during 22 years. 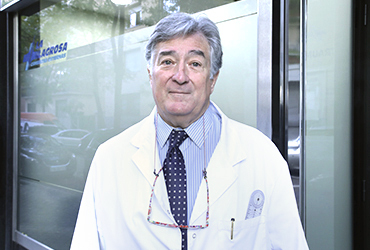 – Medical Director of Manuel Becerro Medical Center, Rehabilitation Unit during 22 years. – Rehabilitation Coordinator in Institute of Traumatology Estevez, Medical Center Nuestra Señora de América, during 23 years. Dr. Jose Manuel Ruiz Soldevilla also collaborates by giving numerous talks and presentations, along with his many publications at conferences and meetings.